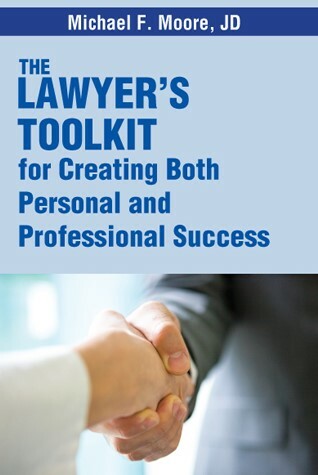 Michael’s book, “The Lawyer’s Toolkit for Creating Both Personal and Professional Success” is available from Thomson West or directly on Amazon in print or e-reader versions. His book provides an incredible amount of practical guidance and is an essential part of every lawyer’s library. With this resource, lawyers can select specific techniques and apply them to their unique personality and practice. Chapter 1: Effective Networking: You Must Give to Get. Chapter 2: Six Degrees to Success: Working Your “Human Web”. Chapter 3: Your Elevator Speech: Who Are You and Why Should I Care? Chapter 4: Business Cards: Not Extinct Yet. Chapter 5: How to Work a Room: The Art of Developing Contacts. Chapter 6: Business Etiquette: Simple Skills That Make You Stand Out. Chapter 7: Social Media Networking: Does This Mean 33 Million People for Lunch? Chapter 8: Effective Planning: Creating a Focus for Success. Chapter 9: Personal Perseverance: Why It Is Not Over Until It Is Over. Chapter 10: The Value of Lists: Get Organized for Success. Chapter 11: Effective Time Management: Doing More with Less. Chapter 12: People Skills: How to Play Nice with Others. Chapter 13: True Grit: Do You Have What It Takes to Do This? Chapter 14: Effective Marketing: What Works for You and Your Firm. Chapter 15: Face to Face Communication: Don’t Hide Behind Your Digital Device. Chapter 16: Personal Credibility: A Critical Skill for Every Lawyer. Chapter 17: The Mutual Value Exchange: You Have to Ask for Their Business. Chapter 18: Team Selling: Creating Growth with Existing Clients. Sustained Adaptability: Can Your Law Firm Handle Change? Chapter 19: A Positive Culture: Mixing the Chemistry for Success. Chapter 20: Mentoring: It Is Like Déjà vu All Over Again. Chapter 21: New Age Lawyers: “We Are Not in Kansas Anymore, Toto”. Chapter 22: Generational Conflict: Irresistible Force Meets Immovable Object. Chapter 23: Succession Planning: A Blinding Flash of the Obvious.